On Monday 22nd April 2019 the sun will rise at 06:26 and will set at 19:51. It will be a mild day, with temperatures reaching around 20.5°C. Today is expected to be a dry day, with a very low chance of rain. It will be a very clam day today, with a maximum expected wind speed of 6mph. On Tuesday 23rd April 2019 the sun will rise at 06:25 and will set at 19:52. Today is epxected to be an extremely warm day and people are advised to stay hydrated and use sun protection if going outside. Temperatures today could reach as high as 29.7°C. Today is expected to be a dry day, with a very low chance of rain. There will be a gentle breeze in the air today, with a maximum expected wind speed of 16mph. On Wednesday 24th April 2019 the sun will rise at 06:23 and will set at 19:53. It's going to be quite a warm day, with temperatures reaching 26.6°C. Today is expected to be a dry day, with a very low chance of rain. It will be a very clam day today, with a maximum expected wind speed of 12mph. On Thursday 25th April 2019 the sun will rise at 06:22 and will set at 19:54. It's going to be quite a warm day, with temperatures reaching 27.3°C. Today is expected to be a dry day, with a very low chance of rain. It will be a very clam day today, with a maximum expected wind speed of 13mph. On Friday 26th April 2019 the sun will rise at 06:21 and will set at 19:55. It's going to be quite a warm day, with temperatures reaching 24.7°C. Some moderate to heavy rain is expected, 5mm of rainfall is possible today. It will be quite a breezy day, with a maximum expected wind speed of 23mph. On Saturday 27th April 2019 the sun will rise at 06:20 and will set at 19:56. It's going to be quite a warm day, with temperatures reaching 24°C. Today is expected to be a dry day, with a very low chance of rain. There will be a gentle breeze in the air today, with a maximum expected wind speed of 14mph. On Sunday 28th April 2019 the sun will rise at 06:18 and will set at 19:57. Today is epxected to be an extremely warm day and people are advised to stay hydrated and use sun protection if going outside. Temperatures today could reach as high as 29.6°C. Today is expected to be a dry day, with a very low chance of rain. It will be quite a breezy day, with a maximum expected wind speed of 15mph. A National Historic Landmark, the White House of the Confederacy, is located in downtown Richmond's historic Court End Neighborhood. The former executive mansion of Jefferson has been meticulously restored to its wartime appearance, when it served as the social, political, and military center of the Confederacy. Guided tours are offered daily and cover the Davis family, life in Richmond during the War, and period furnishings. 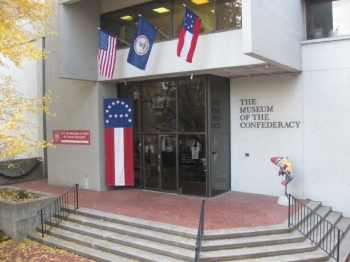 The museum next door offers three floors of exhibitions, showcasing hundreds of personal belongings from soldiers and civilians; uniforms, flags, military equipment & weapons from battles both famous and obscure; the majority of General Lee's campaign possessions; and some the most important images, documents and artwork from the Confederate era.